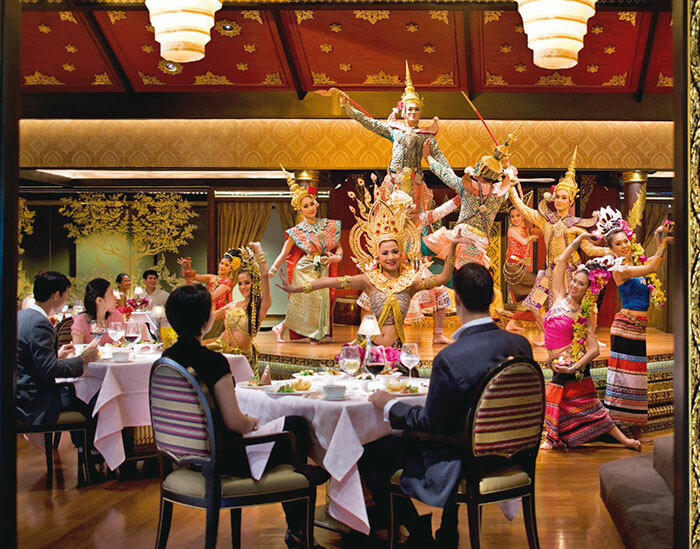 There is a sense of drama about The Oriental in Bangkok. The minute our limo swerves into its historic portals, uniformed staff swoop down upon our strolleys, another suited trio leads us across an opulent lobby to the reception, keys are ceremoniously handed, a traditionally-clad lift boy with the sweetest smile escorts us up with a practised bow and finally, the room is thrown open with a flourish to reveal a dipping sun on the Chao Phraya River through floor to ceiling glass windows. We are expected to gasp. We do. As much for the golden-hued vista outside as for the stunning array of fruits inside, some that can only be savoured in Thailand. As I am to discover later, the flavours that I carry back with me are those of the crisply tart honey jujube and the mildly sweet speckled dragon fruit. Breakfast at the al fresco Riverside Terrace is a serious affair. Tresses gently ruffled by whiffs of wind, we watch baby pancakes make their sizzling journey from the pan to our plates as we dunk them in hot syrup, followed by spicy noodles awaiting a toss from the wok. Chefs work live counters with an endearing passion and the buffet variety is so large, this could well be the meal of the day. But The Oriental flaunts specialty restaurants with an ease that comes from being at the top of the business. The colonial-style China House boasts a popular dim sum menu and, at Lord Jim’s (named after Joseph Conrad’s fictional sea-faring character), the sushi and sashimi are recommended to be attacked without interruption! Le Normandie, set in classic surroundings with panoramic views is all about Michelin star French gastronomy and the open-air Ciao, fanned by lush ferns, is where you get pasta the way Italian mammas make it. For the likes of us who have resolved to see Bangkok’s most revered Buddhas, perhaps all on the same morning (which leaves us with three whole days for the malls), the hotel is also beautifully located. 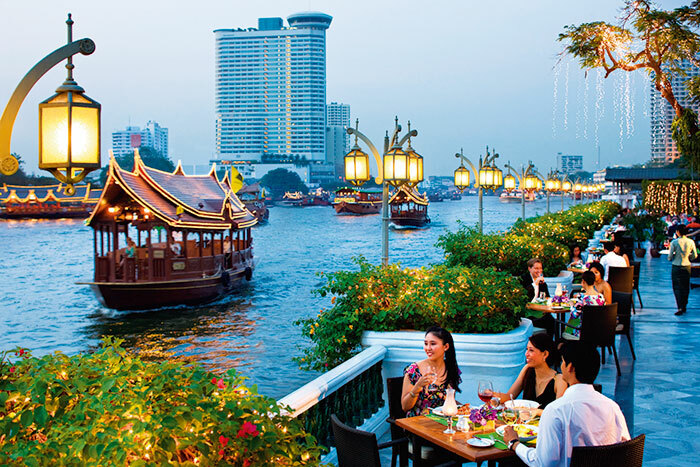 We hop onto a local ‘express’ boat that chugs its way across the busy thoroughfare of Chao Phraya to be dislodged along with its entire load at Chang Pier from where we make a quick trot in the sun to the Grand Palace. At the gate my companion’s clingy tights are declared unfit for further progression, so along with a host of equally inappropriately clad folk, she vanishes into the clothes house and returns with a wraparound skirt to be returned after use! Grand Palace, begun in 1782 as the abode of the Thai royal family, houses the Wat Phra Kaew temple which contains the 15th century-discovered, 18-inch high Emerald Buddha, fashioned from a single block of translucent jade. 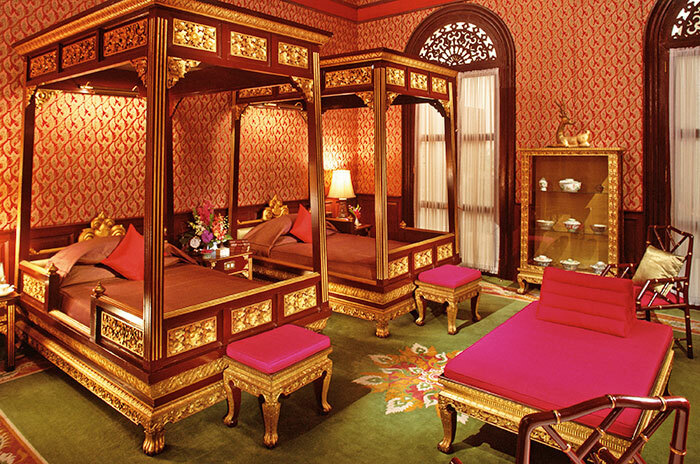 Enshrined on a traditional Busabok throne made of gilded carved wood, it is the most venerated object of worship in Thailand. 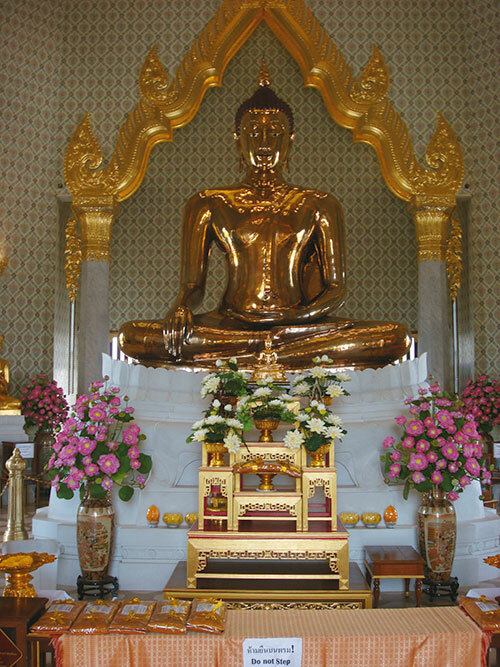 A five-minute tuk-tuk ride along the outer white walls of the Palace brings us to Wat Pho, encasing the 164-feet-long gold-plated Buddha with mother-of-pearl eyes reclining in all its splendour. Though we are within touching distance of the statue in spite of the barriers, it is not really possible to see it in its entirety all at once. 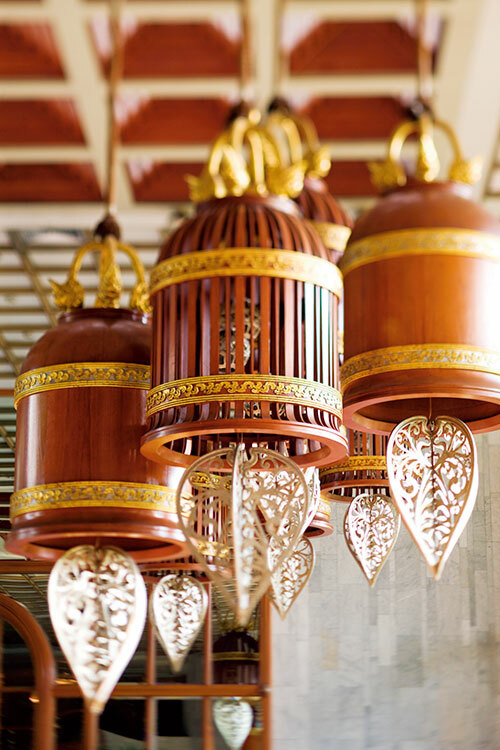 Still, hearing the legends that surround this birthplace of the traditional Thai massage, makes the visit worthwhile and we too, like the devotees before us, drop coins into the little metal pots lining the walls. 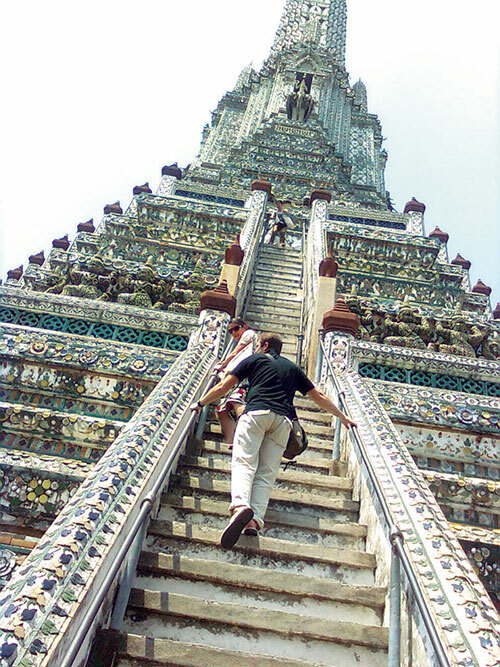 Zig zagging across the river again, we stop at Wat Arun, the Temple of Dawn, an outstanding monument dating from the Ayuthaya period. The towering prang, representing Mount Meru of which we only made it till the steep first floor, is decorated with slivers of Chinese porcelain and glazed ceramic tiles. 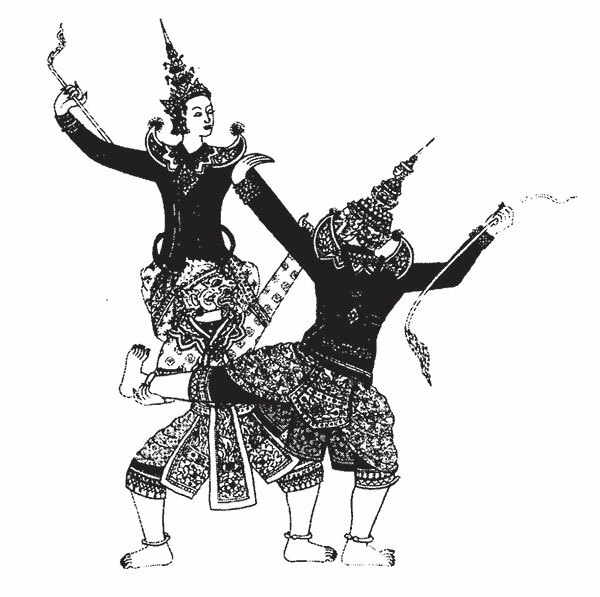 The smaller prangs symbolise the four winds. There are 27000 temples (wats) in Thailand of which 300 are in Bangkok alone and though many of the canals of this ‘Venice of the East’ have been filled up to build roads, the river remains a popular means of transport in a city whose streets often get clogged with slow-moving traffic. Wat Trimitr, the 700-year-old Buddha statue crafted from five tonnes of pure gold and almost 16 feet high is our final outdoor stop after which we find ourselves on the The Oriental’s antique wooden barge being ferried to the spa for much needed body therapy. Gently scrubbed with salts and herbs on temperature controlled platforms, limbs pummelled into submissive slumber, we let the wafting aromas of rose and jasmine relax our senses and return to our rooms floating on the sounds of a live jazz band following us from The Bamboo Bar. The hotel’s 130th birthday celebrations in 2006 were held with unrivalled pageantry, almost with as much pomp as when it reopened in May 1887 on the same site where it had been earlier erected 11 years before. 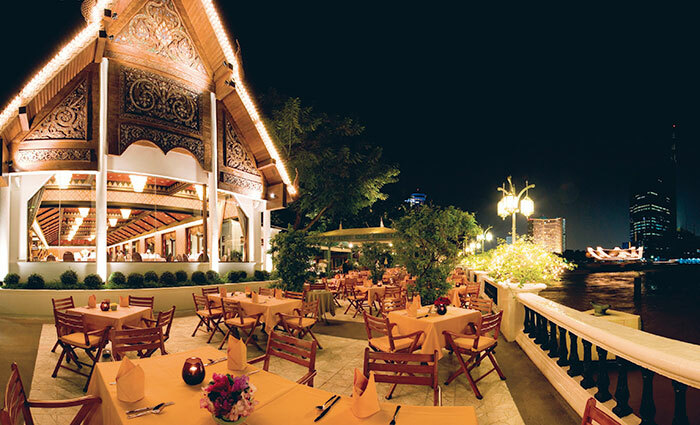 Designed by an Italian architectural firm, the imposing structure was privy to a champagne banquet by invitation only, attended by Thai aristocracy, prominent statesmen, business tycoons and the like. It was said to be the social gala of the decade. And stardust sprinkle in the foyer continued…. This is where the crown prince of Russia, Tsar Nicholas, stayed and where Carl Faberge exhibited his jewellery; where Boris Becker and Michael Schumacher rested their limbs; where former American presidents George Bush and Bill Clinton relished fine Thai cuisine and where Louis Thomas Leonowens, son of Anna Leonowens, of Anna and the King of Siam fame (yes, she existed!) was proprietor in 1893. General Manager Kurt Wachtveitl, himself with the hotel for 40 years, was felicitated recently by guest relations veteran Ankana Kalantananada who retired after 60 years of service! Like the hotel they nurtured so carefully for more than half their lives, they too have acquired legendary status in the annals of its glorious history. And if anybody is wondering whether we descended from the hotel’s lofty heights to watch the city’s famed ladyboy cabaret in the heartland of Bangkok bustle, we did. The Oriental made the reservation! 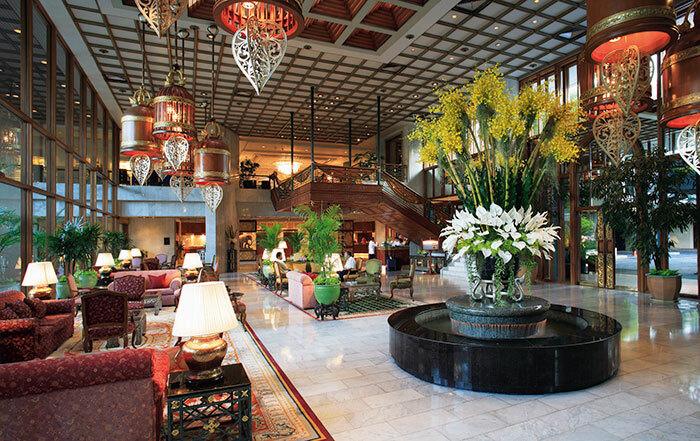 In 2003, Bangkok’s grande dame underwent an uplifting transformation in the restoration of its legendary Authors’ Lounge and the Authors’ Suites. The latter, named after the literary giants who frequented The Oriental, are much in demand where fascinated guests are treated to silk bathrobes, personalised stationery and champagne on a daily basis. Somerset Maugham, in 1922, busy crafting a fairytale about Siam that appears in The Gentleman in the Parlour, found the terrace a restful place while recuperating from malaria. From the Joseph Conrad Suite, you can look out onto a tropical garden, fringed by the river and the Noel Coward Suite with its canopied beds and silken furnishings, is perhaps where the playwright dreamed up much of his staged drama. There’s even a Barbara Cartland Suite decorated aptly in florals and the colour pink! Graham Greene, Tennesee Williams, Iris Murdoch and V S Naipaul are some of the others who made a passage through Bangkok via The Oriental. we join other guests at a cocktail reception at the Authors’ Lounge, adjacent to the suites area, where the mood is vintage Thai. Opaque domed roof, wicker chairs, waving bamboo stalks, animal print furnishings. Between quick bites of innovative finger foods and sips of chilled bubbly, we study the sepia frames crowding the walls that still keep the past so alive….